It's something that relatively few can understand - the thrill of the hunt. Whether it's quail, pheasant, elk or bear, it's a time-honored pursuit that has spawned generations of equipment, techniques and family experiences. And lodging - it's surprising how a sport can bring out the best in a resort or lodge. Check out our Top 10 Hunting Lodges, and you'll see what we mean! Thousands of acres of pristine natural wilderness make Maine of the best hunting grounds in the United States. With some of the best whitetail deer hunting in the state, Northern Outdoors honors that tradition with a variety of hunting packages, an amenity-filled main lodge, and all the unspoiled wilderness you could ask for. There are few places in the world that contain more 200-pound-plus trophy bucks per square mile than the North Woods of Maine. And Northern Outdoors' experienced guides are more than happy to help you bag your trophy buck every fall. Three- and five-day guided hunting trips include meals, lodging, and the expert advice of your knowledgeable guide. This outfitter's goal is to create an atmosphere of camaraderie and friendship while you enjoy the thrill of the hunt. In addition to whitetail hunts, guided bird and small-game hunting packages are also available. After an unforgettable day in the North Woods wilderness, come back to a classic Maine sports lodge and kick up your feet. Relax by the fireplace, reconnect with the free Wi-Fi, or enjoy a frosty beer at the onsite Kennebec River Pub & Brewery. 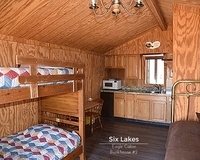 Cozy cabins and lakeside cottages allow you to unwind and feature amenities like a swimming pool, a game room, and much more. Northern Outdoors is the outfitter you've been hunting for! When you're not hunting, why not try hiking through the lush nature trails or setting off on a heart-pumping whitewater rafting adventure? The Kennebec River awaits! Awarded the esteemed honor of 2006-07 Orvis Endorsed Wing Shooting Lodge of the Year, Deer Creek Lodge is the ideal destination for your Kentucky hunting trip! For over 30 years, Deer Creek Lodge has been providing sportsmen with a wide variety of excellent hunting experiences. Whether you're hunting for trophy whitetails, wild turkeys, or small game, the hunting opportunities are many. And, on your trip, you pay just one fee for a no-limit hunting experience. More than just hunting, you will find a wide variety of activities on site. From trophy catch-and-release bass fishing to horseback riding, there is an outdoor adventure to suit your need. If you want to practice your aim before going on a hunting trip, you can even try 5-stand sporting clays. All this and more awaits you! Deer Creek Hunting Lodge was originally established in 1978. Want to get the kids in on the fun? All-inclusive family packages from Deer Creek Hunting Lodge mean the only thing you'll have to worry about is having fun. If you're looking for a fully guided, trophy elk hunting experience in the Big Hole Mountains of Southeast Idaho, you can end your search with Rocky Mountain Elk Ranch. The luxurious comfort of your hand crafted log lodge accommodations along with the adventure of the hunt combine to offer an unforgettable experience. While the success of your elk hunt is 100% guaranteed, the experience is still tailored to be as challenging as you desire. The ranch also offers buffalo and Texas dall sheep hunts. These activities can be added onto a regular hunt, or can be done independently. When you're not hunting, take advantage of your close proximity to Yellowstone National Park, Jackson Hole, Grand Teton National Park, and a variety of other outdoor attractions. At the end of a day full of adventure, retreat to the comfort of the lodge featuring a full kitchen, oversized stone fireplace, and a massive Great Room that offers enough space for everyone in your hunting party. Come discover an unforgettable Idaho hunting experience at Rocky Mountain Elk Ranch. Rocky Mountain Elk Ranch is located in the Big Hole Mountains of Southeast Idaho. Green Canyon Hot Springs is just at the bottom of the hill where you can soak any tired or sore muscles in their thermally heated hot pool. Caryonah Hunting Lodge is the exotic hunting lodge you've been looking for. A variety of different game is available for hunters of all kinds while fishing serves as a more relaxing sportsman's excursion. After bagging that trophy, retreat to the comfort of a luxury cabin! Cradled by the Tennessee's Cumberland Mountains, you'll find breathtaking scenery and a host of hunting options at this lodge. Guests will have a rare and exciting hunting experience when they try to track wild boar. The lodge's premier wild boar hunting isn't the only hunt available, though; in fact, you can also hunt everything from ram and goat to deer or elk. Try an exotic hunt for buffalo or red stag! And, experienced guides will increase your odds of nabbing that elusive trophy. When you're not hunting, soak in the natural splendor. Hike the lush nature trails or cast off on a fishing expedition. After a day of outdoor adventures, luxurious cabins are waiting for you. Fully furnished with beautiful furniture, fireplaces, and other special touches, these cabins were built with sustainable building techniques and bring the charm of the resort's natural surroundings indoors. Come discover the lodge you've been hunting for! Angler can cast a line in one of the stocked private lakes or ponds on the Caryonah Hunting Lodge property. Stocked with bass and bluegill, these fishing holes are available to lodge guests at no additional charge and provide a nice change of pace for outdoor lovers. Rustic meets refined with these luxurious and spacious cabins from Caryonah Hunting Lodge. Each cabin is fully furnished and features Mexican tile and granite in the bathrooms, rich wood furniture, and much more! In many ways, Utah Family Lodges is exactly what it says it is. It's a series of luxury accommodations dispersed throughout the Beehive State. But it's also the quintessential Utah family vacation! Utah Family Lodges' properties are as diverse as the state itself (which is to say, very diverse). Vacation homes are so varied and unique that listing similarities would take less time than the differences. We mean that in the best way, of course, as those differences make each home luxurious and full of unique charm. Some are located on a 700-acre plot and surrounded by mountains, while others are set next to pristine golf courses. Regardless, you'l fall in love with your abode! The Rockies are nearby, and they're glorious! The are nine unique properties! Head to the renowned Texas Hill Country for your next great hunting adventure. Joshua Creek Ranch occupies a uniquely diverse terrain including miles of the spring-fed, crystal-clear Joshua Creek and the famous Guadalupe River. The ranch is recognized among the top wingshooting lodges in the world, and is the ideal destination resort for corporate events, conferences, and reunions. Joshua Creek features quail and upland bird hunting, European-style driven pheasant shooting, and decoyed mallard hunting. You'll also be treated to some of the finest dove hunting in south Texas. The prime wingshooting season spans from October through March, but there are plenty of other experiences to enjoy throughout the year including free range axis deer hunting, sporting clays, and water recreation like fly-fishing, kayaking and tubing. In addition to all of the great things you can do during your stay at the ranch, the property also feature award-winning lodging accommodations perfect for any size of group. Start planning your own hunting trip with the help of the friendly staff at Joshua Creek Ranch. The ranch covers 1,300 acres of widely diverse habitat and terrain that make it seem much larger. Most of the ranch is lightly wooded upland pastures planted with improved grasses that are managed for bird hunting habitat. The bottom land along the Joshua Creek and Guadalupe River are largely open fields planted in food and cover crops, perfect for flushing up pheasant with a line of shooters. The rest of the ranch is heavy timber and the typical Hill Country flora that provides cover and food for excellent Whitetail, Axis deer, and Rio Grande turkey hunting. Joshua Creek Ranch was bought by Joe and Ann Kercheville in 1986. Their plan was to make the ranch a home to their herd of registered Texas longhorn cattle, but all that changed after they experienced driven pheasant shooting in Scotland in 1988 and 1989. They recognized the similarities between the Scottish hunting terrain and their own Texas Hill Country ranch, and they met many Americans who were investing lots of time and money to go "across the pond" for pheasant shooting. Pheasant and chuckar hunting is at its best at Castle Valley Outdoors, making it the perfect place for your next Utah hunting trip. More than a family-owned pheasant hunting lodge, Castle Valley Outdoors is an opportunity to experience the real West away from the hustle and bustle of modern society. This incredible Utah destination is an Orvis-Endorsed wing-shooting lodge and provides excellent all-inclusive hunting packages to make your adventure as successful as it can be. Their Pro Shop is stocked with gear and equipment such as hunting vests and jackets, eye and ear protection, and knives and game shears. Whether you're interested in a 3-day/4-night hunting trip for pheasant and chukar, or a 5-day/6-night lion hunt, Castle Valley Outdoors provides an impressive selection of trips to choose from to fit your interests. The gourmet country cooking and rustic yet luxurious accommodations at Castle Valley Outdoors are just what you need after a successful hunt. The population of Emery, Utah is 268. Castle Valley Outdoors offers a variety of fly-fishing trips to choose from such as 1-day/1-night packages and 2-day/3-night packages. A professional guide will take you to the best local mountain streams and lakes to cast your line for trout, catfish, bass, and bluegill. Imagine a country retreat, where every meal is like grandma used to make and you take off your shoes at the door. Now add in a day of hunting whitetail deer, wild turkeys and more. The result is Harpole’s Lodge, Illinois’ only Orvis approved hunting lodge and your Midwest hunting vacation dream! Pike County, Illinois is well known as one of the best hunting destinations in the country. You’ll have access to thousands of acres of river drainages, wetlands, islands and uplands that are the natural habitat of waterfowl, birds, wild turkeys and whitetail deer. This means that your next prize catch is right outside your door – how’s that for a true hunting lodge! Harpole’s knows that long hunting days can be really exhausting. So when you return to the lodge, you’ll revel in special treatment. We mean bed and breakfast style lodging with a relaxing, country atmosphere. Homemade meals, Amish furniture and themed suites with private Jacuzzis, fireplaces and feather pillows all combine to ensure a restful night. And before you head out for a day of hunting, a hearty, home cooked breakfast will energize you. Welcome to a true Midwest hunting lodge and the ultimate hunting vacation! From Pleasant Hill, take Highway 96 South straight for 4.7 miles. Turn left at 3680N Howell Hollow Rd. Take the first left onto Carrolton Road 770E. The lodge is on the right. From St. Louis, take Highway 70 to Highway 79, and travel north to Louisiana, MO. Turn east on Highway 54. Turn right at the stop sign onto Highway 96. From Alton/East St. Louis you can travel north on the Illinois side of the Mississippi to Highway 96. Look for the sign on Highway 96. In 1825 Calhoun County was formed from the extreme southern portions of Pike County. The pro-slavery residents of "the Kingdom of Calhoun" changed the name of the county seat from Coles Grove (named after an abolitionist Governor of Illinois) to Gilead (a Biblical name). If you are hunting for unique business conference centers and corporate retreat ideas, consider Heartland Lodge's conference facilities. Heartland Lodge is prepared to accommodate corporate retreats of all kinds. With packages for two to forty guests, small groups welcome to reserve individual conference facilities, and conference rooms with full services, this is the perfect place for your corporate retreat! With the average deer from 2014 and 2015 averaging over 220″, a hunting trip to Greystone Castle Sporting Club will be a successful one! Combining incredible accommodations with a majestic backdrop, there are few resorts that can compare to Greystone Castle Sporting Club. Their years of careful wildlife management have resulted in a Whitetail hunting program of high repute, while their selective culling program have produced Trophy Whitetail Deer any hunter will be proud to hunt. Packages vary in experience and length, but just know that there is undoubtedly going to be something that fits you to a "t". Specials offer the best chance of harvesting a true trophy deer. What's a trophy deer, you ask? You'll have to come and find out! 400 yard Steel Target Range ready for use! A hunt of a lifetime awaits you at The JL Bar Ranch & Resort! Offering a variety of hunting scenarios, The JL Bar Ranch & Resort is a hunter's dream come true. Their majestic 13,000-acre retreat provides hunters, of all ages and game preferences, excellent opportunities! And if this is your first time, you can start up your adventure at the Shooting Sports Complex, where professional shooting instructors will prepare you for the hunt! Head out for a traditional whitetail deer, bird hunting, turkey hunting or try something more exotic like blackbuck antelope and axis deer. The ranch's full hunting operations make is easy to plan whatever kind of hunting trip you'd like. Exotic species including axis deer, fallow deer, red stag, and blackbuck antelope roam The JL Bar Ranch & Resort's property. All these species and native birds make the ranch the ideal destination for a Texas hunt of a lifetime! The ranch's onsite general store provides guests guns & licenses! If quail hunting is your specialty, we’ve found a hunting lodge that will make you go weak in the knees (in a good way!) Rio Piedra Plantation puts you smack dab in the middle of the classic plantation belt, where Bobwhite quail are abundant. Here’s your chance for an unforgettable hunting vacation. Tradition is a huge part of the hunt at this Georgia plantation. After a long, lingering, hot Southern breakfast, you’ll head out with your covey in over 6,000 acres of tall grasses, river beds and varied terrain where the quail are so plentiful, you won’t come home empty handed! And after a long day exploring the region, you’ll return to pure luxury at Rio Piedra. Head back to your lodge room after the hunt to relax with a good book and take a nap. Then venture down to the dining room for a traditional Southern meal with a gourmet twist. You won’t lose weight on this hunting trip, but you’ll gain a traditional experience at this Georgia hunting lodge. Your hunting vacation will be extra special at Rio Piedra Plantation. Rio Piedra Plantation is the only two-time winner of the coveted “Orvis Wingshooting Lodge of the Year” award! From Albany, Georgia, travel US 19 to Camilla. Turn right onto GA 37 and travel approximately 10 miles to the fire tower on the right. Turn left onto Turkey Road (dirt road) at the Rio Piedra sign. Go approximately two miles and turn right into the lodge entrance. Rio Piedra Plantation is located in the heart of the classic plantation belt which stretches for roughly 100 miles through southern Georgia and into north Florida. The population density of Bobwhite quail is unlike that of any other place on earth. This is the very epicenter of the quail hunting universe, encompassing nearly 100 contiguous or near-contiguous large plantations, most of which are completely private and date back to the Reconstruction Era. Bring the pastoral environment of the English countryside a little closer to home. At Battenkill Lodge, you’ll be surrounded by teeming rivers and forests in a lodge that provides more tranquility than anywhere else in the Northeast. Battenkill Lodge is the perfect place for your hunting vacation. Four private suites share this fantastic property with miles of private water in the form of ponds, rivers and streams, towering forests strewn with quiet, tranquil paths, birds and other wildlife and expansive meadows as far as the eye can see. This Northern New York scenery is the natural habitat for grouse, deer, ducks and wild turkey – and with such a great variety, hunting season never ends! Go swimming at the onsite pond or pool, or explore your surroundings to find an undisturbed woodland pond for your own personal, private swimming hole. Take a stroll of the grounds with breathtaking views of Goose Egg mountain. Just relax at your private suite on the sun deck with a glass of wine after a long day outside. This is a New York hunting lodge with an old-world feel, perfect for your hunting vacation. The Battenkill Lodge owns two miles of water on the New York Battenkill Trophy area. October brings flights of migrating Woodcock through our coverts, offering exciting upland sport for wing shooters. Woodlands are managed for ruffed grouse (partridge) with gravel trails, clear cut areas, and plantings of wild berry shrubs. The excellent natural cover has been enhanced through selective timber management designed to benefit the wildlife. Trout fishing can be combined with shooting at no extra charge.